The name of the organization is the Missouri State Capitol Commission; a Commission formed by statute (Senate Bill 470) by the 91st General Assembly and by resolution of the Board of Public Buildings given the authority to absorb the duties of the Capitol Review Commission on June 21, 2006. “Commission” – The Missouri State Capitol Commission. “Members” – The individual members of the Commission. A.l. “Articles” – plaques, monuments, statues/busts, pictures, murals or other commemorative and/or memorial articles. A.2. “Board” – The Board of Public Buildings of the State of Missouri. A.3. 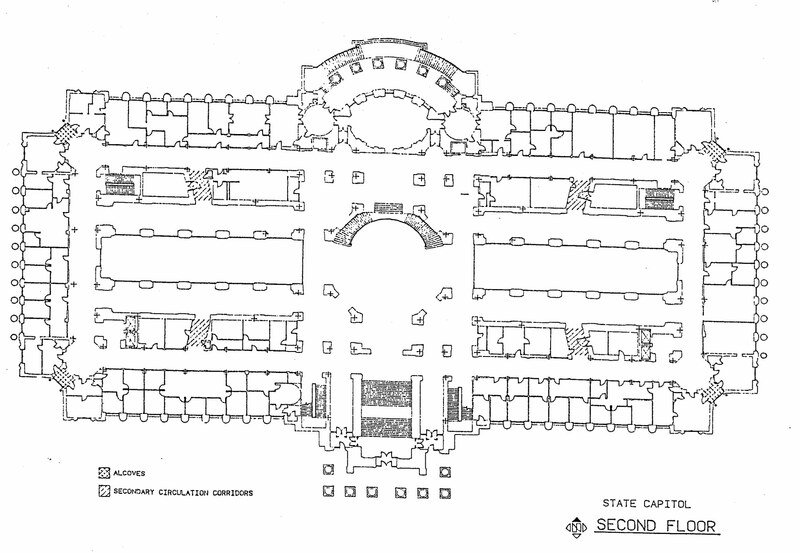 “Capitol Complex” – All buildings, structures and grounds under the control of the Board of Public Buildings, as defined in Chapter 8, RSMo, including the State Capitol, the Governor’s Mansion, the Governor’s Garden, the Missouri State Supreme Court Building, the Jefferson Landing area, the Harry S Truman State Office Building, the Kirkpatrick State Information Center, the Jefferson State Office Building, the Broadway State Office Building, the Department of Highways and Transportation Building, the EDP/Health Lab Building, the George Washington Carver State Office Building, the Missouri Adjutant General Building, the Environmental Control Building, Maus House, Missouri Boulevard Warehouse, Patrol Lab, Professional Registration, Richmond Hill Building/Discovery Place, Simpson Building, Lewis and Clark State Office Building, New Health Lab, the State Parking Garages, state-owned surface parking lots in the areas surrounding the aforementioned buildings and all grounds associated with said buildings and facilities. A.4. “Commission” – The Missouri State Capitol Commission. A.5. “Expandable Articles” – An article meant to be expanded after initial installation with the addition of other names, sections, pieces, etc. A.6. “Members” – The individual members of the Commission. A.7. “Memorial” – An article designed or established to serve as a remembrance of a person or event. A.8. “Monument” – An article placed or erected as a commemorative or memorial, or venerated for historic, aesthetic or other significance. A.10. “Plaque” – A plate, slab or disk that is ornamented or engraved for mounting that provides decoration and/or information. A.11. “Statue/bust” – A form or likeness of an individual person, sculpted, modeled, carved or cast in material such as stone, clay, wood or bronze. B.1. This Policy is being instituted in response to the Resolution adopted by the Board on June 21, 2006, directing the Commission (f/k/a Second State Capitol Commission) to assume the responsibilities formerly held by the Capitol Review Commission to establish guidelines for the selection and placement of all plaques, monuments, statues, pictures (framed or mural) and other articles in or on buildings and grounds under control of the Board of Public Buildings. The duties delegated to the Commission by the Board’s resolution are subject to the control of the Board, and the Board’s delegation of responsibility may be rescinded, in whole or part, at any time. B.2. It is recognized that, without guidelines and left uncontrolled, the stateliness of facilities comprising the Capitol Complex could be lost due to random, inappropriate or excessive placement of such articles. Therefore, to protect these precious assets of the State, it is necessary to establish these guidelines. B.3 It is the intent of this Policy to provide guidelines for determining which articles are appropriate for display and how and where these articles can be displayed. In this respect, the Capitol Complex can be protected and can be a place of enjoyment and learning for all Missourians. What defines “appropriate”? B.4. 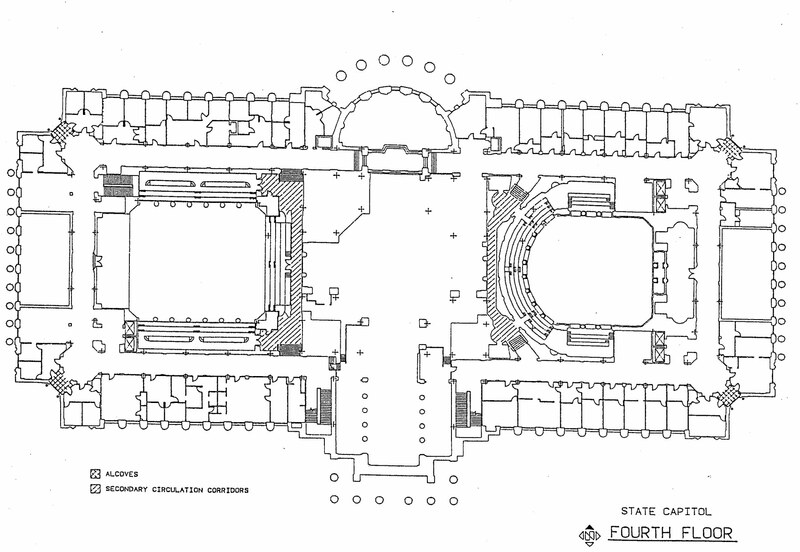 Any new or additional articles or expansion· of existing articles to be placed in or on buildings and grounds comprising the Capitol Complex shall, after the effective date of adoption of related sections of this Policy, require approval by the Commission prior to actually being displayed. B.5. All articles given to the State for placement under the jurisdiction of the Missouri State Capitol Commission shall be donated to the State of Missouri through the Commissioner of the Office of Administration for a period not to exceed six (6) months. Articles may also be loaned for placement and a copy of the loan agreement shall be filed with the Commissioner of the Office of Administration. Each request will be reviewed on a case-by-case basis. B.6. No financial responsibility to third parties shall be incurred or assumed by the State of Missouri with respect to any article, with the exception of routine maintenance, unless funds are provided by private sources, by act of the General Assembly or from other authorized public sources. B.7. The attached maps (pgs. 8-12) are intended to provide clarification of specific areas referred to throughout this Policy where articles may be considered for placement. B.8. Subject to the right of rescission, in whole or part, of the responsibilities delegated to the Commission by the Board, described in Paragraph B.1 above, the members of the Commission may from time to time amend and alter this Policy. This Policy may be amended at any meeting of the Commission. C.1.1. Only articles with a subject matter or content of great importance to the State of Missouri shall be considered for placement in or on the State Capitol or Capitol Grounds. Define “great importance”. C.1.2. Articles selected for placement in or on the State Capitol and Capitol Grounds, with the exception of pictures, must be constructed of long-lasting, permanent materials that are not susceptible to damage from moisture, mildew, fungus or insects. C.1.3. Expandable articles which are meant to be expanded after initial installation with the addition of other names, sections, pieces, .etc. are not encouraged and will only be considered on a case-by-case basis. To be considered, long-term future expansion must be provided for in the initial design of any such article. applicable to any proposed return of the item to the Capitol Complex. Clarification needed. C.1.5. Expansion of new or existing articles will be considered by the Commission on a case-by-case basis. Should future expansion of a new or existing article require additional sections or pieces, such sections or pieces must match the physical characteristics of the original article. C.1.6. Any plant to be used as a memorial or commemorative article shall be submitted to the Office of Administration, Division of Facilities Management, Design and Construction, for review and recommendation with regard to the overall landscaping scheme ·for the Capitol Grounds prior to review and action by the Commission. C.1.7. The hanging of items on interior marble walls, rails, pillars, etc. throughout the Capitol Building is expressly forbidden by the Commission. C.2.1. Due to limited public access at this time, placement of articles in the basement of the State Capitol is not recommended but may be considered if necessary. C.3.1. The corridors are reserved for directories and/or name plates of elected officials. With the exception of statewide elected officials, all such directories and/or nameplates shall be mounted flush to walls or doors. No articles shall be placed in the corridors of the first floor. C.3.2. Due to the prominence and stature of the State Capitol rotunda, no new articles shall be placed therein. The Office of Administration approves temporary exhibits in the rotunda which is done through a scheduling process requiring a permit requested through and approved by the Office of Administration, Division of Facilities Management, Design and Construction. C.3.3. The Commission’s recommendation regarding placement of articles in State Museum spaces will be based upon highly restrictive criteria commensurate with the significance of a State Museum. Articles intended for placement in the Museum areas in the east and west galleries of the first floor shall be submitted by the Commission to the Museum Director for review and recommendation prior to review and action by the Commission. galleries for display of Governors’ portraits as deemed appropriate by the Commission and the Museum Director. 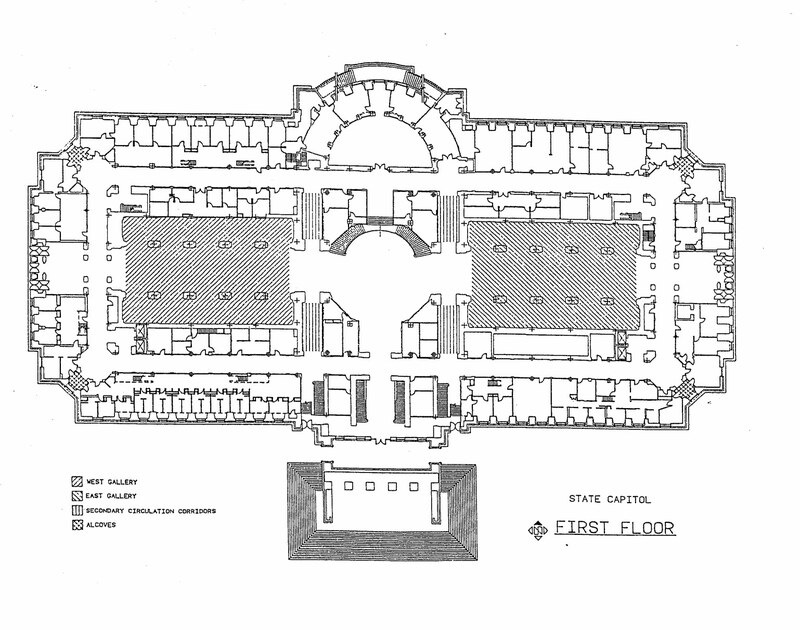 The east and west entryways are used for temporary exhibits along with the north side of the rotunda under the stairs. C.3.3.2. Articles intended for placement in the Museum areas in the east and west galleries of the first floor, if deemed by the Commission to be more suitable or appropriate as an addition to Museum collections, shall be submitted by the Commission to the Museum Director and will not be reviewed by the Commission. Acceptance of any such article into Museum collections by the Museum Director does not entitle or guarantee immediate or continued display of the article. C.3.3.3. The Commission does not exercise authority over the content of Museum exhibits nor the Museum Director’s acceptance or rejection of any article considered for addition to Museum collections. C.3.4. The alcoves and secondary circulation corridors which are public spaces of the first floor may be considered for placement of articles. C.4.l. The corridors are reserved for directories and/or name plates of elected officials. With the exception of statewide elected officials, all such directories and/or nameplates shall be mounted flush to walls or doors. No articles shall be placed in the corridors of the second floor. C.4.2. Due to the historic significance of the existing murals in the east and west galleries, no additional articles shall be placed therein. C.4.3. Due to the prominence and stature of the State Capitol rotunda area, no new articles shall be placed therein. C.4.4. The alcoves and secondary circulation corridors which are public spaces of the second floor may be considered for placement of articles. C.5.1. The corridors are reserved for directories and/or name plates of elected officials. With the exception of statewide elected officials, all such directories and/or nameplates shall be mounted flush to walls or doors. The only articles allowed in the corridors are class (composite) pictures of members elected to each session of the General Assembly. Since wall space is limited in the corridors, the number of pictures that can be displayed will be limited by the amount of available wall space and the ability to display them in a visually pleasing manner as determined by the Commission. As the amount of available wall space decreases, the Commission may recommend the removal and storage of some previous General Assembly pictures to make room for new pictures. C.5.2. The rotunda and grand entrance area of the third floor shall be reserved for the display of statues and busts honoring famous Missourians. C.5.3. The alcoves and secondary circulation corridors which are public spaces of the third floor may be considered for placement of articles. C.6.1. The corridors are reserved for directories and/or name plates of elected officials. With the exception of statewide elected officials, all such directories and/or nameplates shall be mounted flush to walls or doors. The only articles allowed in the corridors are class (composite) pictures of members elected to each session of the General Assembly. Since wall space is limited in the corridors, the number of pictures that can be displayed will be limited by the amount of available wall space and the ability to display them in a visually pleasing manner as determined by the Commission. As the amount of available wall space decreases, the Commission may recommend the removal and storage of some previous assembly pictures to make room for new pictures. C.6. 2. The alcoves and secondary circulation corridors which are public spaces of the fourth floor may be considered for placement of articles. D.7.1. No articles shall be placed in any spaces of the fifth floor of the Capitol. D.8.1. No articles shall be displayed on the building exterior or on its component parts (steps, columns, rails, etc.) The Capitol building is part of the National Register of Historic Places and, as such, shall not have its character altered or defaced by articles attached to it. C. 9.1. Articles placed on the Capitol Grounds shall have no flagpoles with flags as part of the display. This is not intended to limit the display of the flag as an image in any article. C.9.2. Any plant used as a memorial or commemorative article shall have no accompanying descriptive plaque or monument. If any such plant should die, it will not be replaced by the State. It may be replaced by the original donor, but only after review by the Office of Administration and approval by the Commission. C.9.3. 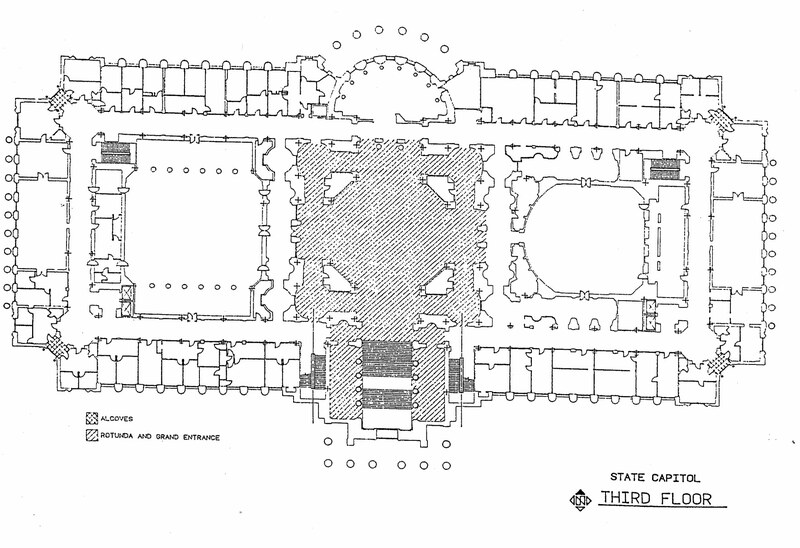 At this time, the only lawn area that will be considered for placement of articles is the northwest lawn as indicated on the attached map of the Capitol Grounds. Placement of articles in this area shall be contingent upon space available and the aesthetics of the area as determined by the Commission. The intent of this Policy is to prevent the Capitol Grounds from becoming cluttered with articles. Careful consideration shall be given to each request by the Commission to evaluate the aesthetic impact on this area and the Capitol Grounds as a whole. The concept is to create a park-like setting, appropriately landscaped, with articles interspersed in the setting. The articles shall be designed in a subdued fashion so as not to detract from the setting or the State Capitol Building itself. C.9.4. All other lawn areas shall remain landscaped and no additional articles shall be placed in these areas.